Here, we present a standardized series of protocols to observe the superior ocular sulcus, a recently-identified, evolutionarily-conserved structure in the vertebrate eye. Using zebrafish larvae, we demonstrate techniques necessary to identify factors that contribute to the formation and closure of the superior ocular sulcus. Yoon, K. H., Widen, S. A., Wilson, M. M., Hocking, J. C., Waskiewicz, A. J. Visualization of the Superior Ocular Sulcus during Danio rerio Embryogenesis. J. Vis. Exp. (145), e59259, doi:10.3791/59259 (2019). Congenital ocular coloboma is a genetic disorder that is typically observed as a cleft in the inferior aspect of the eye resulting from incomplete choroid fissure closure. Recently, the identification of individuals with coloboma in the superior aspect of the iris, retina, and lens led to the discovery of a novel structure, referred to as the superior fissure or superior ocular sulcus (SOS), that is transiently present on the dorsal aspect of the optic cup during vertebrate eye development. Although this structure is conserved across mice, chick, fish, and newt, our current understanding of the SOS is limited. In order to elucidate factors that contribute to its formation and closure, it is imperative to be able to observe it and identify abnormalities, such as delay in the closure of the SOS. Here, we set out to create a standardized series of protocols that can be used to efficiently visualize the SOS by combining widely available microscopy techniques with common molecular biology techniques such as immunofluorescent staining and mRNA overexpression. While this set of protocols focuses on the ability to observe SOS closure delay, it is adaptable to the experimenter’s needs and can be easily modified. Overall, we hope to create an approachable method through which our understanding of the SOS can be advanced to expand the current knowledge of vertebrate eye development. The formation of the vertebrate eye is a highly conserved process in which carefully orchestrated intercellular signaling pathways establish tissue types and specify regional identity1. Perturbations to early eye morphogenesis result in profound defects to the architecture of the eye and are frequently blinding2. One such disease results from the failure to close the choroid ocular fissure in the ventral side of the optic cup3. This disorder, known as ocular coloboma, is estimated to occur in 1 out of 4-5000 live births and cause 3-11% of pediatric blindness, commonly manifesting as a keyhole-like structure that protrudes inferiorly from the pupil in the center of the eye4,5,6. The function of the choroid fissure is to provide an entry point for early vasculature growing into the optic cup, after which the sides of the fissure will fuse to enclose the vessels7. While ocular coloboma has been known since ancient times, we have recently identified a novel subset of coloboma patients with tissue loss affecting the superior/dorsal aspect of the eye. Recent work in our lab has led to the discovery of an ocular structure in the zebrafish dorsal eye, which we refer to as the superior ocular sulcus (SOS) or superior fissure8. It is important to note that the structure has characteristics of both a sulcus and a fissure. Similar to a sulcus, it is a continual tissue layer that spans from the nasal to the temporal retina. In addition, the closure of the structure is not mediated by a fusion of the two opposing basement membrane, and it appears to require a morphogenetic process by which the structure is populated by cells. However, similar to a fissure, it forms a structure that separates the nasal and temporal sides of the dorsal eye with the basement membrane. For consistency, we will refer to it as SOS in this text. The SOS is evolutionarily conserved across vertebrates, being visible during eye morphogenesis in fish, chick, newt, and mouse8. In contrast to the choroid fissure, which is present from 20-60 hours post-fertilization (hpf) in zebrafish, the SOS is highly transient, being easily visible from 20-23 hpf and absent by 26 hpf8. Recent research in our lab has found that, similar to the choroid fissure, the SOS plays a role in vascular guidance during eye morphogenesis8. Although the factors that control the formation and closure of the SOS are not yet fully understood, our data did highlight roles for dorsal-ventral eye patterning genes8. Zebrafish is an excellent model organism to study the SOS. As a model system, it provides a number of advantages in studying eye development: it is a vertebrate model; each generation exhibits high fecundity (~200 embryos); its genome has been fully sequenced, which facilitates genetic manipulation; and approximately 70% of human genes have at least one zebrafish orthologue, making it an ideal genetics-based model of human disease9,10. Most importantly, its development takes place externally to the mother, and its larvae are transparent, which allows for the visualization of the developing eye with relative ease11. In this set of protocols, we describe the techniques through which the SOS can be visualized in zebrafish larvae. The variety of visualization techniques used in this report will allow clear observation of the SOS during normal eye development, as well as the ability to detect SOS closure defects. Our example protocols will feature investigations of Gdf6, a BMP localized to the dorsal eye and known regulator of SOS closure. Further, these techniques can be combined with experimental manipulations to identify genetic factors or pharmacological agents that affect proper SOS formation and closure. In addition, we have included a protocol through which the fluorescent imaging of all cell membranes is possible, allowing the experimenter to observe morphological changes to the cells surrounding the SOS. Our goal is to establish a set of standardized protocols that can be used throughout the scientific community to offer new insights into this novel structure of the developing eye. All methods described here have been approved by the University of Alberta Animal Care and Use Committee. In a tank of dechlorinated water, prepare crosses of gdf6a+/- zebrafish in the evening by pairing a male zebrafish with a female zebrafish. Be sure to separate the male from the female by using a divider to ensure that the embryos are born within a small range of time. The following morning, pull the divider and allow the zebrafish to breed for no longer than 30 min. Collect the embryos in Petri dishes with E3 media, described in The Zebrafish Book12, and place them in a 28.5 °C incubator. Remove any unfertilized eggs or dead embryos, which will appear white and opaque. At 20 hpf, replace the E3 media with E3 media containing 0.004% 1-phenyl 2-thiourea (PTU) to prevent pigment production. NOTE: Addition of PTU at a slightly later timepoint, such as 22-24 hpf, is unlikely to interfere with the experiment due to the early age of the embryos at the time of imaging. However, it is recommended to treat the embryos early to completely prevent pigmentation as there is a band of pigmentation that appears in the dorsal eye, which can interfere with the imaging of the SOS. Ensure that all embryos are at the correct developmental stages at various points leading up to the time of observation. It is recommended that this is done at the stages at which somite number is clearly visible as outlined by Kimmel et al.13. Remove those that are developmentally immature. Place the embryos under a dissecting microscope, and dechorionate the embryos by gently pulling apart the chorion using fine forceps. Visualize the SOS in the dorsal eye. The SOS may appear as an indentation at the dorsal margin of the eye, and a line should be visible across the dorsal eye. For normal SOS closure, observe the embryos at around 20-23 hpf. For examination of delayed SOS closure phenotypes, observe the embryos at 28 hpf or later. Sort the embryos that show SOS closure delay from those that do not. To photograph these embryos using a dissecting microscope, prepare a Petri dish containing 1% agarose in E3. Lightly prick the center of the agarose to create a shallow hole in which the yolk of the embryo can sit when the embryo is placed on the agarose. This will ensure that the embryo is not at an oblique angle when being photographed. Anesthetize embryos with 0.003% tricaine in E3 and place laterally on the agarose. To image the embryos using a compound or confocal microscope, transfer the embryo into 35 mm Petri dish containing a small bolus of non-gelled 1% low-melting point agarose in E3 (w/v). Quickly position the embryo laterally using a fine fishing line or an eyelash and wait for the agarose to cool. Once the agarose is firm, pour enough E3 into the dish to cover the agarose. For more details, see Distel and Köster14. NOTE: If using an inverted microscope, the embryo can be placed against the glass of a glass-coverslip-bottom dish and imaged with a standard 20X objective lens. Use a water immersion 20x objective lens to visualize the SOS with a compound microscope. Following visualization, gently pull the agarose from the embryos and fix in 4% paraformaldehyde (PFA) or allow to continue their development. Dechorionate embryos as described in Step 1.2.3, if not already done. Fix embryos in a microcentrifuge tube at the desired timepoint in freshly made 4% PFA for 2 h on a room temperature (22-25 °C) shaker. Wash in 1x PBST for 5 min, four times. NOTE: Following gastrulation, embryos may fix better after dechorionation. Permeabilize embryos in 10 mg/mL proteinase K at room temperature for 5 min. Incubation time will depend on the developmental stage at which the embryos are fixed (see Thisse and Thisse15). Wash in 1x PBST for 5 min, four times. Block embryos in a solution of 5% goat serum and 2 mg/mL bovine serum albumin (BSA) in 1xPBST for 1-2 h on a room temperature shaker. Prepare primary antibody solution by diluting rabbit anti-laminin antibody in block solution at a 1:200 dilution. Incubate the embryos in anti-laminin primary antibody overnight on a 4 °C shaker. Wash in 1x PBST for 15 min, five times. Prepare secondary antibody solution by diluting goat anti-rabbit Alexa Fluor 488 antibody in 1x PBST to a dilution of 1:1000. NOTE: It is possible to adapt this step to suit the resources available to the experimenter by using a different secondary antibody. Incubate the embryos in secondary antibody overnight on a 4 °C shaker. Shield from light as much as possible from this step onwards. Wash in 1x PBST for 15 min, four times. The embryos can be stored at 4 °C for up to a week, if necessary. If desired, place the embryos in a small Petri dish and deyolk the embryos in 1x PBST. Do this by gently disrupting the yolk with fine forceps and removing the yolk cells through mild scraping of the yolk sac. Prepare the following concentrations of PBS-glycerol series solutions in microcentrifuge tubes: 30%, 50%, and 70% glycerol in PBS. Transfer embryos into 30% glycerol/PBS, making sure to place the embryos on top of the solution and transferring as little of the previous solution as possible. Wait for the embryos to sink to the bottom of the tube. When embryos have sunk to the bottom, transfer them to 50% glycerol/PBS. Repeat and transfer to 70% glycerol/PBS. Once the embryos have sunk in 70% glycerol/PBS, move them to a small plastic dish for dissections. Sever the embryo posterior to the hindbrain, and use the posterior tissue for genotyping, if necessary. Move the head to a glass slide, transferring as little glycerol as possible. Use forceps or other fine dissection tools to hold onto the posterior end to keep the head stationary. Use a fine minutien pin or other fine dissection tools to gently insert into the forebrain ventricle from the anterior and push downward to separate the right and left halves of the head from each other. Repeat this while moving posteriorly through the midbrain and into the hindbrain ventricle, essentially fileting the head down the midline. This minimizes manual manipulation of the eye and surrounding tissue, thereby leaving the SOS undamaged. Mount each side of the head midline down, eye up. Position four posts of vacuum grease at the corners (an appropriate distance apart for the coverslip being used) and cover with a glass coverslip, pushing down sequentially on each post until the coverslip makes contact with the samples. Pipette 70% glycerol at the edge of the coverslip so that the glycerol is pulled underneath, filling the space between the coverslip and the slide. Image samples within a day, or seal around the coverslip with nail polish and image samples only after the nail polish has dried. Store in the dark at 4 °C. Linearize 1 mg of pCS2-eGFP-CAAX plasmid16 with NotI in a reaction volume of 40 mL for 4 hours at 37 °C. To stop the restriction digest reaction, add 10 mL RNase-free water, 2.5 mL 10% SDS and 2.0 mL 10 mg/mL Proteinase K.
Incubate 1 hour at 50 °C. NOTE: RNase-free water is added in two separate occasions to prevent excessive dilution of the sodium acetate. Add 200 mL phenol:chloroform:isoamyl alcohol and vortex for 20 s. Separate the aqueous and organic phases through centrifugation at 18,000 x g for 5 min. Transfer the upper aqueous layer to a new microcentrifuge tube, making sure to avoid the transfer of the bottom organic layer. Add an equal volume of chloroform to the new tube. NOTE: Addition of chloroform is optional, but it is recommended to ensure complete removal of phenol from the sample. Vortex for 20 s. Separate the aqueous and organic phases through centrifugation at 18,000 x g for 5 min. As before, transfer the upper aqueous layer to a new microcentrifuge tube, making sure to avoid the transfer of the bottom organic layer. Add 1/10 volume of 3 M sodium acetate pH 5.2. Precipitate DNA by adding 3 volumes of 100% RNase-free ethanol and chill at -20 °C for 15 min. Centrifuge at 18,000 x g for 20 min at 4 °C. A pellet should be visible. Decant the supernatant. Wash the pellet with 100 mL of cold 70% ethanol/RNase-free water. After gently mixing to break the pellet loose, centrifuge at 18,000 x g for 15 min at 4 °C. A pellet should be visible. Decant the supernatant. Air-dry the pellet for 5 min and resuspend the DNA in 7 mL water. NOTE: The pellet may need to be dried for longer than 5 min depending on the airflow available. In an RNase-free manner, prepare an in vitro transcription reaction with a commercially available Sp6 RNA polymerase kit, using about 1 mg of purified linearized plasmid DNA obtained in Step 3.2. Incubate for 2 h at 37 °C. NOTE: Sp6 RNA polymerase must be used for the production of capped mRNA. Add 1 mL of DNase (2 U/mL; RNase free) and incubate for 30 min at 37 °C. Purify the mRNA with any commercially available RNA purification kit. Aliquot the mRNA to avoid repeated freeze-thaw, and store at -80 °C. Obtain embryos as outlined in Protocol 1.1. Using a microinjection apparatus, inject 300 pg of eGFP-CAAX mRNA at the 1-cell stage. Screen for embryos with the bright expression of eGFP in the eyes using a fluorescence stereoscope. Image the embryos as described in Protocol 1.2. Alternatively, dechorionate and fix the embryos at the desired timepoint in 4% PFA for 4 hours at room temperature or overnight at 4°C. Wash the embryos in 1x PBST for 5 min, four times, and dechorionate, if not previously done. Dissect the eyes and mount them on slides as described in Protocol 2.3. The zebrafish SOS appears at 20 hpf in the presumptive dorsal retina8. By 23 hpf the SOS transitions from its initial narrow architecture to a wide indentation and by 26 hpf it is no longer visible8. Therefore, to examine the SOS during normal zebrafish eye development, the embryos must be observed between 20-23 hpf. During this period, the SOS is observable through the dissecting microscope and via DIC imaging as a thin line in the dorsal eye that separates the nasal and temporal halves of the developing retina (Figure 1). In addition, a subtle indentation may be visible in the dorsal boundary of the eye (Figure 1). Following immunofluorescent staining of laminin, the thin line can be confirmed to be the basement membrane (Figure 1). To examine molecular pathways resulting in delayed SOS closure, we chose to observe the embryos at 28 hpf as this is a timepoint that is sufficiently removed from the time of normal SOS closure and is, therefore, a reliable marker of SOS closure delay due to experimental manipulations. Through direct visualization of 28 hpf zebrafish under the dissecting microscope, it is possible to evaluate SOS closure delay due to experimental manipulation. When SOS closure is delayed, its prolonged presence can be seen as a pronounced cleft in the dorsal side of the eye under the dissecting microscope (Figure 2). When observed under the compound microscope using DIC or Nomarski optics, this feature is even more prominent, and the nasal and temporal sides of the eye are separated by the SOS, which is clearly visible as a line in the dorsal eye (Figure 3). The SOS is lined with basal lamina components, including laminin. Therefore, immunofluorescent staining provides a complementary method of evaluating SOS closure in fixed embryos. When imaging the embryonic eye from a lateral view, the basal lamina demarcates the outside margin of the eye, both ocular fissures, and the border between the lens and the retina (Figure 4). The SOS is oriented directly opposite to the choroid fissure in the dorsal aspect of the eye. Whole embryos can be mounted laterally, with somewhat better optical clarity achieved if eyes are previously microdissected. By 28 hpf, in wildtype zebrafish, laminin staining demonstrates clearly that the SOS is completely closed, which makes this the ideal stage for monitoring delays in fissure closure. Injection of eGFP-CAAX mRNA allows visualization of the cell membranes of a live or fixed embryo (Figure 5). Successful one-cell stage injection is sufficient to produce embryos with complete cell membrane fluorescence. In the lateral view, all cellular boundaries should be marked by GFP fluorescence, and as such, cell morphology is also clearly observed. This allows the visualization of the morphological changes to the cells that lead to SOS closure. Figure 1: Observation of SOS during normal zebrafish eye development. Zebrafish embryos were collected and imaged at 22 hpf. A-B. Lateral view of 22 hpf embryos live-imaged with the dissecting microscope (A) and via DIC imaging (B), respectively. The SOS is marked by a red asterisk. C. Laminin immunofluorescent staining of a 22 hpf embryo. Embryos were fixed in 4% PFA and obtained for whole-mount immunofluorescent staining of laminin. The embryos were fileted and mounted in 70% glycerol/PBS. Single slice images were obtained through confocal imaging with a software. The SOS is marked by a white asterisk. All figures were annotated and assembled using Adobe Illustrator software. Scale bars represent 50 mm. Please click here to view a larger version of this figure. Figure 2: Dissecting microscope images of SOS closure delay in zebrafish larvae. 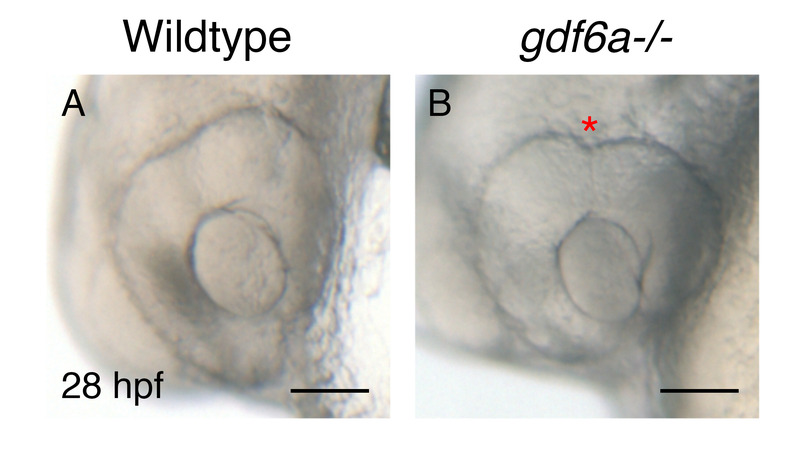 Wildtype and gdf6a-/- embryos were collected and live-imaged at 28 hpf. A. Lateral view of a wildtype embryo with a closed SOS. B. Lateral view of a gdf6a-/- embryo with an SOS closure delay (asterisk). A sharp depression is observable in the dorsal aspect of the eye due to the failure of the SOS to close appropriately. Scale bars represent 50 mm. Please click here to view a larger version of this figure. Figure 3: Representative DIC images of the SOS in the zebrafish embryonic eye. Wildtype and gdf6a-/- embryos were collected, anesthetized, and placed laterally in 1% Ultrapure low-melting point agarose in E3 on a 35 mm Petri dish. The dish was filled with E3, and a compound microscope with a 20x water-dipping objective was used for DIC imaging. A. Lateral view of a wildtype embryo with a closed SOS. B. Lateral view of a gdf6a-/- embryo with an SOS closure delay (asterisk). The SOS is observable as a thin line in the dorsal aspect of the eye. Scale bars represent 50 mm. Please click here to view a larger version of this figure. Figure 4: Representative images of laminin immunofluorescent staining in embryonic zebrafish eye. Wildtype and gdf6a-/- embryos were collected and fixed in 4% PFA at 28 hpf. The basal lamina was immunostained, and the embryos were fileted and mounted in 70% glycerol/PBS for confocal imaging. Single slice images were obtained using ZEN software. A. Lateral view of a wildtype embryo with a closed SOS. B. Lateral view of a gdf6a-/- embryo with an SOS closure delay (asterisk). The basal lamina is shown outlining the eye in green, with the SOS visible in the dorsal part of the eye in gdf6a-/- embryos. Scale bars represent 50 mm. Please click here to view a larger version of this figure. Figure 5: Imaging of the zebrafish embryonic eye following eGFP-caax mRNA injection. Wildtype embryos were injected with 300 pg of eGFP-caax mRNA at 1-cell stage. At 22 hpf and 28 hpf, respectively, the embryos were anesthetized and mounted laterally in 1% Ultrapure low-melting point agarose in E3 on a 35 mm Petri dish. A confocal microscope with a 20x water-dipping objective was used for imaging, and single slice images were obtained using a software. A. Lateral view of a gdf6a-/- embryo at 22 hpf with a visible open SOS (asterisk). B. Enlarged panels of a gdf6a-/- embryo at 22 hpf. C. Lateral view of a gdf6a-/- embryo at 28 hpf with a SOS closure delay. 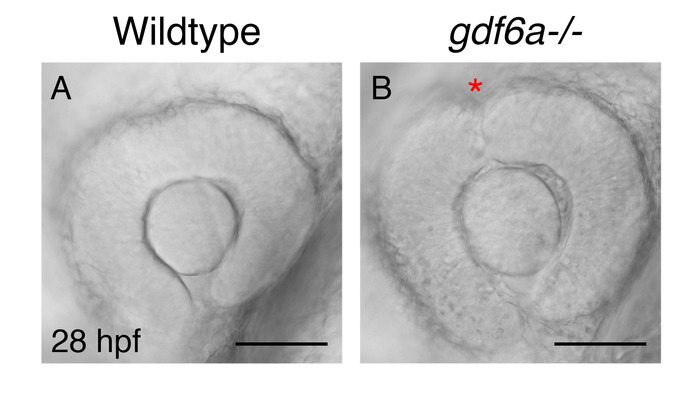 D. Enlarged panels of a gdf6a-/- embryo at 28 hpf. Scale bars represent 50 mm and 10 mm in Panels A and C, and B and D, respectively. Please click here to view a larger version of this figure. Here, we present a standardized series of protocols to observe the SOS in the developing zebrafish embryo. To determine closure delay phenotypes, our protocols have focused on the ability to distinguish the separation of two discrete lobes of the dorsal-nasal and dorsal-temporal sides of the eye, similar to techniques used to visualize choroid fissure closure delay phenotypes in the ventral eye. These visualization techniques can be used in conjunction with a variety of genetic manipulation techniques to study the effects of inhibiting or inducing expression of certain genes to study their roles in the closure of the SOS. We have chosen to demonstrate these protocols using gdf6a-/- embryos as we have previously shown that its loss can affect proper closure of the SOS, but the protocols can be used to study the effects of manipulating the expression of any gene as required. It is recommended that any morphological changes to the dorsal eye are studied preliminarily with observations using the dissecting microscope. The other techniques should be used once an initial link is established definitively, as they are more time-consuming and lower throughput. While the protocols can be easily modified to suit the needs of the experimenter, there are several aspects that must be followed carefully. Because of the transient nature of this structure, it is imperative to ensure that all observed embryos are of the same developmental stage. For our work, we find it important to allow only a small window of breeding time and to periodically sort the embryos throughout early development. The most important step of equalizing stages is at 20 hpf, when you can still accurately count somites (24)17, and we find this much more reliable than the staging hallmarks that delineate time at 28 hpf. In addition, pigmentation must be inhibited or removed to ensure successful visualization of the structure. We have observed the pigmentation in the eye begins to start around 22 hpf, and there is a pattern of pigmentation in the dorsal eye that can interfere with proper visualization of the SOS. Therefore, it is highly recommended to treat the embryos with PTU prior to pigmentation to ensure successful visualization. Additionally, dissection of the embryonic eye prior to slide mounting without causing damage requires some practice. It is also imperative to laterally mount the eyes as parallel as possible to the slide. It is recommended that the experimenter practices these techniques with extra embryos prior to the experiment. With the exception of the immunofluorescent staining of the basal lamina, all of the protocols described here can be completed using live embryos. This allows continual visualization of the SOS throughout early embryogenesis, allowing the experimenter to conduct time-lapse studies of the morphological changes involved in the closure of the SOS. In the past, we have used retina-specific transgenes, such as Tg(rx3:eGFP), which marks the neural retina during early development. Although it lacks the ability to visualize cell membranes, the use of Tg(rx3:eGFP) has the advantage of not requiring microinjections and has been our primary method of visualizing gross morphological changes to SOS architecture in real-time. That protocol has not been included here, as similar methods have been discussed previously in this journal18,19. However, investigation of cell biological basis of SOS formation and closure will require membrane fluorescent proteins. Specifically, the injection of eGFP-CAAX mRNA allows visualization of the cell membranes around the SOS as seen in Figure 5, which allows us to study the dynamics of cell shape changes in the dorsal eye that are required for proper SOS closure. 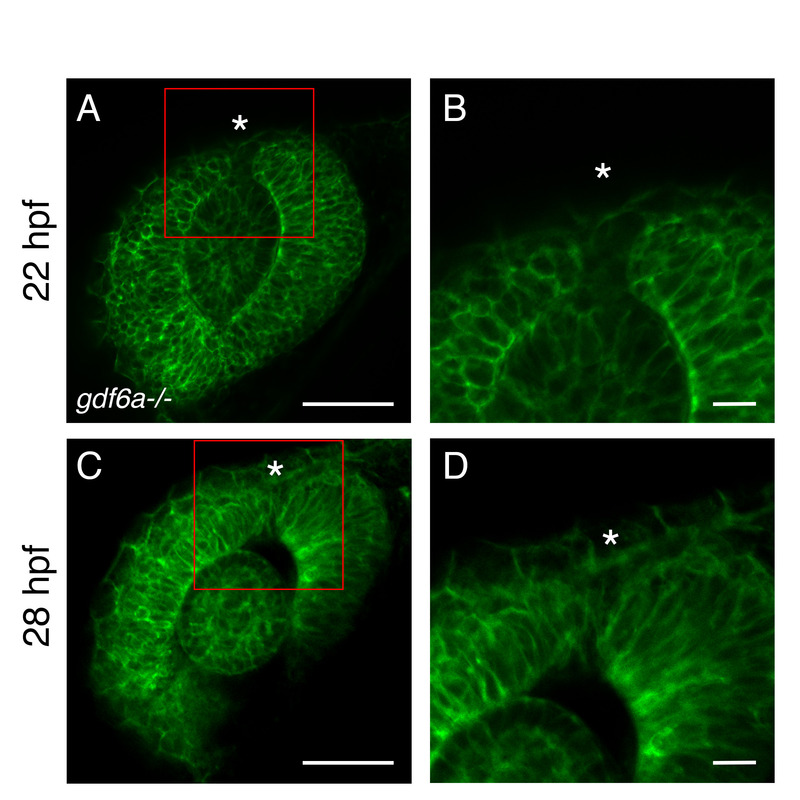 While eGFP-CAAX can be useful for performing live-imaging of SOS closure, it is made difficult by the presence of the enveloping layer in zebrafish. In addition, care must be taken when analyzing results from mRNA injections because it can result in mosaicism, making it difficult to directly compare embryos based on quantification of eGFP expression strength. 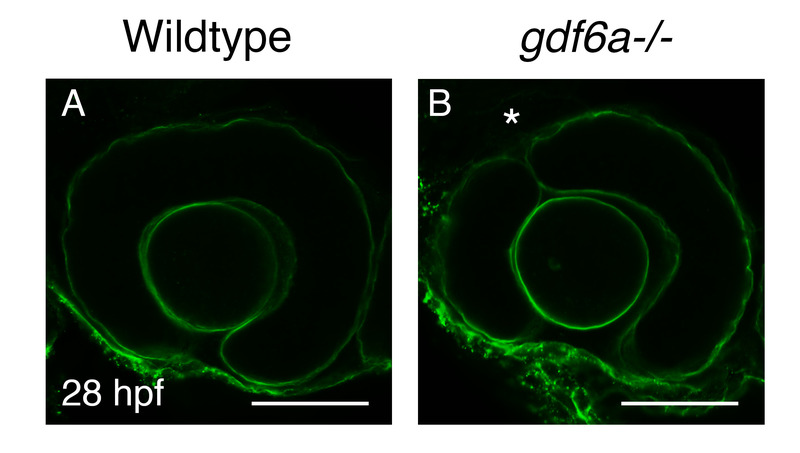 This could be ameliorated through the use of transgenic zebrafish lines that fluorescently label cell membranes specifically in the developing retina, such as Tg(vsx2.2:GFP-caax). One of the challenges of our protocols lies with any treatment that is not fully penetrant. We have previously noted that SOS delays can be seen in about 10% of control embryos at 28 hpf8, and this underlying presence of embryos with an SOS within any given experimental group could make it difficult to observe subtle effects of experimental manipulation. This could be addressed by blinding the experimenter to reduce experimenter bias and by increasing the number of embryos used within each experimental group to increase the power of the experiment. In addition, the stage of analysis could be shifted to 29-30 hpf. With this set of protocols, we seek to standardize the way through which SOS closure delays are visualized. The techniques described above have been shown to be reliable in detecting and visualizing SOS closure delays in a variety of experimental settings and are adaptable to the experimenter’s needs. While we have used techniques such as scanning electron microscopy or time-lapse imaging of transgenic embryos to visualize the SOS in greater detail, our aim here is to create a standardized set of protocols that are amenable to high-throughput experimental designs to visualize a large number of embryos in a single day with emphasis on the ability to score closure delay phenotypes. In addition to its use with gdf6a-/- embryos, we have been able to observe SOS closure delay phenotypes using these visualization techniques alongside pharmacological treatments, morpholino injections, and RNA overexpression studies. As the role of the SOS in eye development is elucidated further through various means, we hope that this standardized set of protocols provide the scientific community a common language through which this novel structure is studied. This work was supported by Canadian Institutes of Health Research (CIHR), Natural Sciences and Engineering Research Council (NSERC), Alberta Innovates Technology Futures, and Women and Children's Health Research Institute (WCHRI). Chow, R. L., Lang, R. A. Early eye development in vertebrates. Annual Review of Cell and Developmental Biology. 17, (2001). Slavotinek, A. M. Eye development genes and known syndromes. Molecular Genetics and Metabolism. 104, (448-456), (2011). Gregory-Evans, C. Y., Williams, M. J., Halford, S., Gregory-Evans, K. Ocular coloboma: a reassessment in the age of molecular neuroscience. Journal of Medical Genetics. 41, (12), (2004). Onwochei, B. C., Simon, J. W., Bateman, J. B., Couture, K. C., Mir, E. Ocular colobomata. Survey of Ophthalmolgy. 45, 175-194 (2000). Williamson, K. A., FitzPatrick, D. R. The genetic architecture of microphthalmia, anophthalmia and coloboma. European Journal of Medical Genetics. 57, 369-380 (2014). Chang, L., Blain, D., Bertuzzi, S., Brooks, B. P. Uveal coloboma: clinical and basic science update. Current Opinion in Ophthalmology. 17, 447-470 (2006). Kaufman, R., et al. Development and origins of Zebrafish ocular vasculature. BMC Developmental Biology. 15, (18), (2015). Hocking, J. C., et al. Morphogenetic defects underlie Superior Coloboma, a newly identified closure disorder of the dorsal eye. PLOS Genetics. 14, (3), (2018). Lawson, N. D., Wolfe, S. A. Forward and reverse genetic approaches for the analysis of vertebrate development in the zebrafish. Developmental Cell. 21, (1), (2011). Howe, K., et al. The zebrafish reference genome sequence and its relationship to the human genome. Nature. 496, (7446), (2013). Bilotta, J., Saszik, S. The zebrafish as a model visual system. International Journal of Developmental Neuroscience. 19, 621-629 (2001). Westerfield, M. The Zebrafish Book; A guide for the laboratory use of zebrafish (Danio rerio). 5th edition, University of Oregon Press. Eugene, Oregon. (2007). Kimmel, C. B., Ballard, W. W., Kimmel, S. R., Ullmann, B., Schilling, T. F. Stages of embryonic development of the zebrafish. Developmental Dynamics. 203, 253-310 (1995). Distel, M., Köster, R. W. In vivo time-lapse imaging of zebrafish embryonic development. Cold Spring Harbor Protocols. (2007). Thisse, C., Thisse, B. High-resolution in situ hybridization to whole-mount zebrafish embryos. Nature Protocols. 3, 59-69 (2008). Kwan, K. M., Otsuna, H., Kidokoro, H., Carney, K. R., Saijoh, Y., Chien, C. A complex choreography of cell movements shapes the vertebrate eye. Development. 139, 359-372 (2012). Kimmel, C. B., Ballard, W. W., Kimmel, S. R., Ullman, B., Schilling, T. F. Stages of Embryonic Development of the Zebrafish. Developmental Dynamics. 203, 253-310 (1995). Gfrerer, L., Dougherty, M., Liao, E. C. Visualization of Craniofacial Development in the sox10: kaede Transgenic Zebrafish Line Using Time-lapse Confocal Microscopy. J. Vis. Exp. (79), e50525 (2013). Percival, S. M., Parant, J. M. Observing Mitotic Division and Dynamics in a Live Zebrafish Embryo. J. Vis. Exp. (113), e54218 (2016).